'10 Endrathukulla', the movie which stars Vikram and Samantha Ruth Prabhu in the lead roles has been ruling the top titles of entertainment portals from the date of its announcement. The shooting of this Vijay Milton directorial is almost completed, and the makers are now busy with the post production works of the flick. The recent news from the corner is regarding the finalization of release date of the flick. Fox Star Studios, the distributors of the movie has revealed that this new movie will hit the theaters on October 2nd 2015, Gandhi Jayanthi. The ’10 Endrathukulla’ crew expect huge collections from this Gandhi Jayanthi weekend. The release date may have been fixed as per the Tamil Film Producer Council’s regulation that calls for releasing the films with star value only on festival/national holidays. 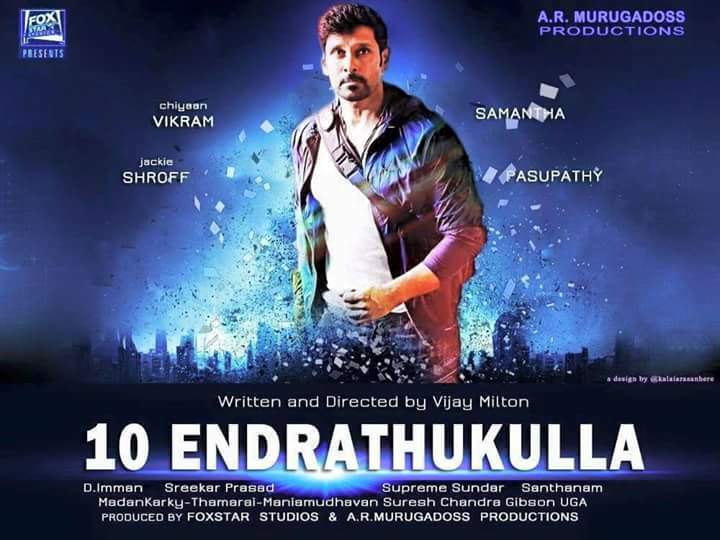 ’10 Endrathukulla’ is expected to be a high voltage action thriller. Apart from Vikram and Samantha, the film also stars Pasupathy, Jackie Shroff, Abhimanyu Singh and Manobala in other prominent roles. Charming beauty Charmme Kaur is reportedly doing a cameo appearance in the flick. D Imman has composed the music of the movie, while Anthony will take care of the editing. Vijay Milton himself has cranked the camera for the movie. The film is produced by A R Murugadoss.